Information was released in the USA as "Sentry"
8.00 points at 22 votes (rank 79). How can you describe The Sentinel? I’ll give it a try: a three-dimensional hide-and-seek game from the 1st person perspective in a surreal-looking chessboard-like landscape. The aim is to absorb as much energy as possible and finally to absorb the watcher that is positioned at the highest point of the level. In a sense we all already had suspected it: somewhere in a parallel dimension or simply just veeery far “out there“, 10.000 layers hover more or less silently through space. Each one is reigned by a grim guard, the Sentinel, that silently and motionlessly watches that there is no change in his territory, which is pervaded by airy plateaus and gaping clefts and overgrown with trees. So it was for scores of eras, until the player suddenly invaded this idyll in the shape of a robot, to end the reign of the Sentinels. In words: ten thousand. This is of course a lot. As you cannot save the game, each level is equipped with an eight-digit number code. the only exception is level 0000 where the game starts. You get further codes after you have successfully finished a level, i.e. when you have absorbed the Sentinel and taken his place at the highest point of the landscape and terminally do a “hyper jump” (s. below). Then you can continue the game after entering the next codes. After entering a correct code the player is shown an overview of the upcoming level, where the position of the Sentinel and if necessary of other enemies is displayed. The own starting position is not shown, but you can assume that especially in higher levels you will be in the worst position that is imaginable. At the beginning of the game the levels are relatively flat and dispose of far areas and little roughness, that could hinder you in moving forward. The player controls the robot from the 1st person perspective. He can turn around his own axis with the keys S or D and with U 180 degrees, as well as rotating the view with L and , up or down to orientate. He cannot walk. All items at places, whose base area is visible can be absorbed. For this you call up cross lines with Space , head for the corresponding base area (precise aiming for the pixel might be necessary) and press A . Rocks can be absorbed without seeing the corresponding base area. The energy value of the absorbed item will be added to the player’s energy. To create a new robot a cross line is called up with the key Space that you steer to the desired field or respectively to a just created rock to then press R .
With Q you then go into the new shell. For this you should call up the cursor and aim for the feet of the new shell. Creating a new shell costs 3 units of energy, of which you only have 10 units available at the beginning. If the energy is out, you cannot create any more shells. Normally you will absorb the old robot shell straight away, so that no energy will be lost through the "movement". ...in all colours of the season. The things that look like folded sunshades are trees and can be absorbed by the robot to gain new energy. A tree represents the lowest energy unit in the game and has an energy value of 1. By pressing Space the cross line appears again to be steered to a field where a tree is standing. With the help of A this tree will be absorbed and one energy unit will be added to the player’s stock. This way any number of trees can be absorbed. Trees on too high situated, not visible areas cannot be absorbed. With T trees can also be created, which only seldom makes sense (as protection from the gaze of the Sentinel). Build-up of an artificial observation platform. Rocks can be created for 2 energy units and serve only one purpose: gaining height where the game area offers no other possibility to move upwards on a slightly higher level by creating a new robot. They are exactly created like a new shell, only that you press B for it after focusing on an aim area with the cross line. If you then finally create a new robot on the uppermost rock and transfer into it, you have noticeably gained height and with this probably access to further fields, trees and finally also the position of the Sentinel. In the upper left of the screen the residual energy is shown in symbols. A tree symbol is for one, a rock symbol for two and a robot symbol for 3 units. A golden robot stands for full 15 energy units. If the energy of the robot falls off through the influence of the enemies (s. below) to a negative value it will be destroyed and an animation shows who exactly has snuffed out your life. Wishful thinking: a Sentinel in optimal firing position. As soon as the player makes only the slightest sound (turns do not count, but a 180 degree movement does!) the Sentinel comes to life and from now on will creakily turn 30 degrees around his own axis every ten seconds with the aim to get the robot into sight. If he makes it, the scan display is activated and shortly afterwards one energy unit will be subtracted from the stock of the robot every five seconds and in exchange a tree is created at a random position in the landscape. If the player makes it to absorb the Sentinel and create a robot on its pod, to transfer into it and then make a hyper jump (s. below), he will have made the level. This Sentry will soon be gone! STRESS! Rough gaze duel between robot and a pack of Sentries. In higher levels the Sentinel gets active backup by the Sentries, which are just as dangerous as the Sentinel, but which are standing on lower positions and are thus easier to get. In levels higher than 1000 complete packs of Sentries (about 5-7) are not uncommon. If a Sentinel or Sentry can see the head of a robot, but not his base, this will be shown by a half-filled scan display and the player can at least not lose energy by absorption. Instead an even meaner action is triggered: a tree in the surrounding will be converted to a Meanie, a fast turning creature with the ability to force the robot to do a hyper jump. Not only will this jump probably bring him to a lower position, it will also cost him 3 energy units, which of course can lead to a negative energy value and with this to destruction. A hectic scratching sound announces that a Meanie has been created. The graphics are simple and remarkably abstract, which massively emphasizes the spooky aspect of the game. Trees look like painted Christmas Firs or the already mentioned sunshades and one cannot just like that recognize the rocks as such. Robots and enemies seem like roughly carved fetishes from forgotten, stone-aged cultures which only make them appear even more alien. And exactly because there was no importance attached to objective graphics (and could not be), everything falls smoothly into place and creates an own, unreal atmosphere. The SID chip has mainly a timeout in this game, as its part is restricted only to sporadic, nonetheless effectively presented creaking, humming, fizzling and sizzling, the rest of the happening mostly wraps itself in icy silence. Virtually lost in reverie and alien though seem the very short melodic insertions when transferring or at the "Game Over". The speed of the graphics is for the circumstances of the C64 o.k., if you consider that the sonny was not really made for filled vector graphics. The screen might noticeably hang sometimes (about 1,5 seconds), especially when there’s a lot going on and – which is especially nerving - when you are in a hurry, but it is still in a bearable range. There has already been worse to suffer. The graphics is by the way not calculated while turning, but when changing the position, that’s why this takes relatively long. Additional objects (Sentinel, trees etc.) are inserted or removed subsequently. At the right edge of the world, the Nothing gleams happily. But don’t be afraid, you cannot fall down. H hyper jump, costs 3 energy units – creates a new robot at a random place either on the same or (probably!) a lower height and changes to it. On the pod of the sentinel the level is finished successfully with this jump. As you cannot afford to waste your energy, given up robots and not needed rocks should be quickly reabsorbed. Furthermore, your own scrap can possibly block your view. Always stay on the move! As long as you tidy up behind you, moving is "free". Energy gets never "lost" in a level. Energy that is subtracted by the Sentinel, reappears in the shape of trees somewhere in the level, same as the Sentinel doesn’t just dissolve robot shells and rocks, but converts them to (several) trees. So if you are longer in the visual gaze of a Sentinel, don‘t panic, but just collect the trees again. Keep an eye on Sentinels and Sentries: they always either turn clockwise or anti-clockwise, and cannot change a once chosen direction i.e. cannot turn back. In what direction they turn depends in the start position of the robot. At the beginning of the level you should maintain a low profile and look for places, where you are seen by only few enemies, to harvest trees. When you have collected enough energy, you should stack many rocks onto each other to gain height as fast as possible. A left behind robot shell or created rock are changed into trees if they get into the gaze of the Sentinel or the Sentries. As soon as you have absorbed the Sentinel, you cannot gather any more energy. You proceed as many levels as you have energy; you should not be standing on an unnecessarily high rock tower when absorbing the Sentinel. Some levels are disproportionately difficult or need a hyper jump right at the beginning; in this case you should play the level before that once again and finish it with a different energy value. Turns with activated cross line take significantly longer. A turn with the key U most of the time saves valuable time. The less terrain needs to be displayed, the faster you can move. Immediately go upwards, look sharp! If one creeps around in the lower regions, risks to be detected and blown into the stratosphere. Only if you resort to higher levels as fast as possible, you will have a chance to dispose of your enemies. The hyper jump is virtually useless and should only be used in an extreme emergency. To be allowed to transport oneself for three energy units to an almost sure worse (because lower lying) position, is an offer that you can easily reject. It is not without a reason that the Meanies use this ability against you. As the trees cannot be absorbed by the enemies you often can block their view by creating a tree. Now the board will be swept! Finally arrived at the top, the robot takes revenge on his tormentors and eliminates one after the other, before he beams himself to the field of the Sentinel. The Remember version of the game possesses options for unlimited energy and a level jump. Further codes can be found here. The Amiga/ST versions use other codes. Robotron2084: "Panic, claustrophobia, paranoia! Games as The Sentinel are released only once in a blue moon, games that really exceeded the until this point known dimensions and went completely new, even though at first, strange ways. And it is really not astonishing, that when seeing this bizarre concept, the question marks will at first swell out of one’s ears. My very first impression of this game was surely not a good one, but the game knows how to grip you, as soon as you have acquired the basic rules. The whole ambience is perfect, the game mechanisms are ideally thought-out and were really ground-breaking in 1986. However, with 10.000 levels even the biggest enthusiasm wears off and the game degenerates to routine, gets monotonous and in higher levels simply unplayable difficult and unfair. Furthermore, the keyboard layout is unhappily chosen. A real mess is by the way, that after level 9999 the game simply starts again from the beginning!!!! No end graphics, no congratulation screen, nada, nihil, nothing, zilch, ничто! THIS was really not necessary, oh well...the journey is the reward. 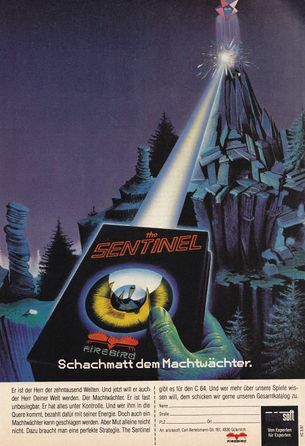 However: even at the risk of going too far out on a limb, I would claim that The Sentinel is one of the most inventive and strangest games of all times. 9 out of 10 points." 1570: "You must have played Sentinel, or else you have missed one of the most interesting game principles. Alone the aha effect, when you have worked yourself up and can see more of the level, is nice. I find the game graphically very felicitous; what other C64 game offers filled vector graphics? A few faults disturb a bit: the controls are strange, why not at least optional movements by joystick? ; on the map at the beginning the own position is not shown, that’s why it is not much use; the viewing direction of the enemies is partly very hard to recognize; the game is basically very slow and ropy; the in the cross line-mode gradually notchy scrolling exasperates you sometimes: some levels are unfair (hyper jump right at the beginning necessary) or disproportionately difficult (Level 279: three enemies, Level 303: two, Level 335: six?! – this can be better implemented even with a pseudo coincidence...); from the nice hide-and-seek game there is often only a hectic transferring-around without any real plan left. Things as looking around in the pause mode with resetting the viewing direction when continuing would have been nice, or a top view map with a display of the enemies incl. current viewing direction – whereas this would of course have changed the game character significantly and which is also my point of view of this game. For its time the game is almost unrestrictedly great." Developed originally for BBC Micro by Geoff Crammond, who also programmed the C64 conversion and cross-compiler used in the development of Amstrad CPC conversion. The editorial staff of the English game magazine Zzap64 was in such a way overwhelmed, that it was not able to provide it with the usual voting in percent points and instead quickly gave it a gold medal. The company Psygnosis released under the title "Sentinel Returns" a remake of the game for the PC with at that time up-to-date graphics and an impressive soundtrack in 1998, at whose design allegedly the horror movie pope John Carpenter had a finger in the pie. The title image of the game is an 8-bit homage to the picture "Eye" of the Dutch illustrator M.C. Escher. There is a for the C64DTV adapted version of the game, that offers better controls (by joystick and the five DTV buttons) as well as higher speed. The game was awarded the British Golden Joystick Award in the category Best Original Game of the Year in 1986. The complete energy at the end of a level is counted (screenshot of the last created robot as proof). 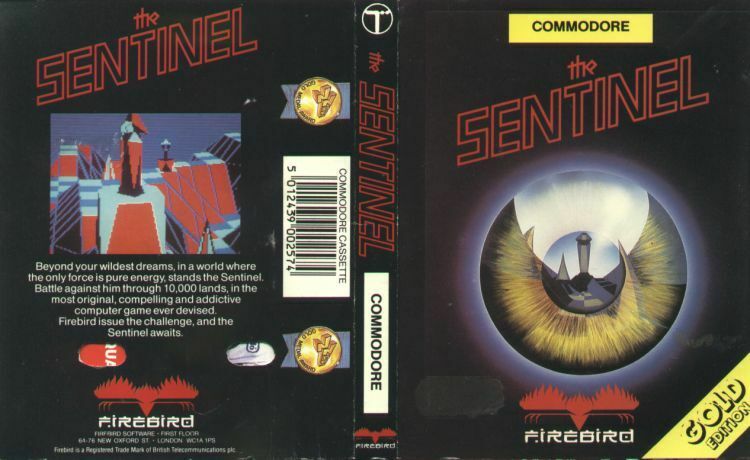 Video at YouTube "The Sentinel - The Review (C64 Version)"
This page was last modified on 5 January 2019, at 20:57.